Malaysia's vast expanses of rainforests are home to more than 700 species of exotic bird-life, including some extremely rare ones. Approximately 63 of these species are endemic (found nowhere else in the world) to Malaysia. This rich and diverse wildlife is reflected on its postage stamps. 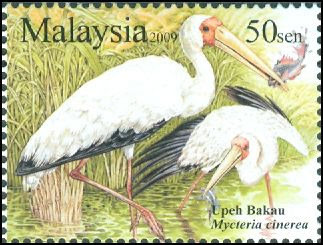 On 21th Jan 2009 Malaysia issued a set of 3 beautiful stamps named “Unique Birds of Malaysia”. 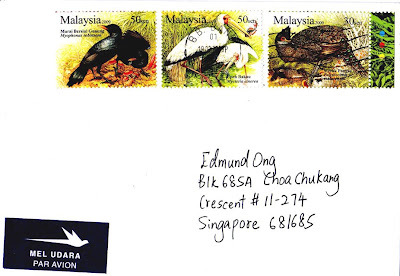 This set of stamps can be seen on this lovely cover sent by fellow blogger Siew Lan. Thank you! 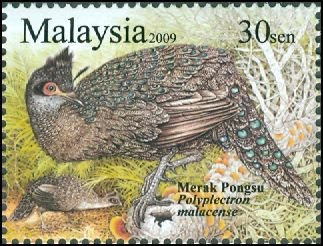 The Malaysian Peacock-Pheasant (Polyplectron malacense) is one of the gems of Malaysia’s bird species and is now on the list as one of the of the four species special or endemic to Peninsular Malaysia. Previously widespread in Thailand and Sumatra, today they are only confined to Central Peninsular Malaysia. The Malaysian Peacock-Pheasant is medium-sized, up to 53 cm long, brownish with blue-green oceilli on its wings, back and tail. It has elongated glossy green crest and bare orange facial skin. The female is smaller and its colours duller. Milky Stork (Mycteria cinerea) is a large wading bird of freshwater habitat, living in wetlands and wet farmlands across southern Asia. They are also found on the coast, where intertidal wetlands provide food and refuge. Milky Stork can reach a length of 97cm and has a thick, yellowish bill and blackish flight feathers. Both sexes look almost alike. this species can be found in Kampuchea, Peninsular Malaysia and most of the larger Indonesian Islands. 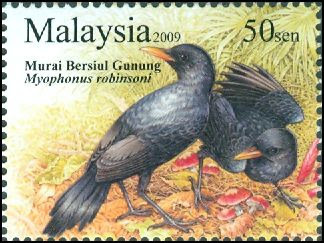 The Malaysian Whistling Thrush (Myophonus robinsoni) is one of the four endemic birds of Peninsular Malaysia. It is a rare and reclusive bird found in broadleaf evergreen forest, preferring streams as well as hills and highlands. About 26cm in size, the thrush has a small yellowish bill, bright metallic blue and black wings and body. Both sexes look alike. 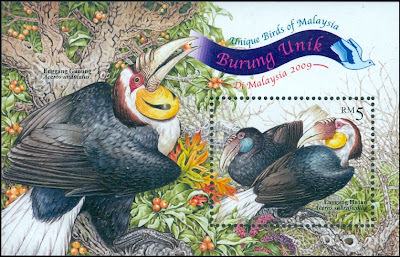 In addition a miniature sheet depicting Plain-pouched Hornbill (shown below) was issued as part of this beautiful set. The Plain-pouched Hornbill (Aceros subruficollis) has a rather black body and a pouch without any visible marking, hence the name "plain-pouched". The females have a blue pouch while the males have a yellow pouch. Overall, the Plain-pouched Hornbill closely resembles the Wreathed Hornbill except for the lack of corrugations on its beak and the lack of any visible marking on its pouch. Plain-pouched Hornbills are found at deciduous, dry and humid evergreen forests, mainly in the lowlands and even hills to about 1,000 m elevations. It has a varied diet, mainly comprising of fruits, but also invertebrates and small vertebrates. Plain-pouched Hornbills makes its habitat in the area between south-east Myanmar to northern Peninsular Malaysia.